The panoramic x-ray is a wonderful modern invention. It has much less radiation than a full set of 18 smaller x-rays and is more comfortable for the patient. It can be taken quickly and is helpful when a patient is in pain. This radiograph should be taken every 3 years and having a series of them on the same patient can assist the dentist in determining whether changes seen are normal. It shows a large area of the mouth, all in one radiograph. The panoramic x-ray shows the nasal area, maxillary sinuses, jaw joints, teeth, upper jaw, lower jaw and surrounding bone. It can reveal cysts, tumors, bone irregularities and more. It usually shows both jaw joints and an unusual flattening in a joint can mean that there's a TMJ problem. The lower jaw can also have an indentation on its lower boarder when a patient has been clenching and grinding. It shows the entire mandible, including all of its lower boarder. A full mouth series of smaller x-rays would not show this indentation. Impacted teeth that are buried deep inside the jaw bones can be seen. Because we regularly take this radiograh on every patient, we are often the first to tell a patient of a previously unknown impacted tooth. 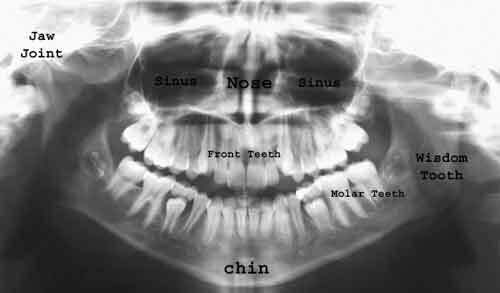 Many dentists do not look at the nasal and sinus areas but the panoramic x-ray shows most of the maxillary sinuses and the nasal opening. Radiographic examination of the maxillary sinuses can show polyps in the sinus, abnormal liquids in the sinus, and can show when the roots of the upper teeth stick into the sinus cavity. This is very important because some toothaches are caused by sinus problems and nothing should be done to the teeth. In this case, this x-ray can help avoid unnecessary dental treatment. The panoramic x-ray is not the same as a full mouth set of dental x-rays. It shows much more than a bunch of smaller x-rays. Very often the nerve going to the lower lip can not be seen in a full mouth set. Paralyzing the mandibular nerve is a possible complication of dental surgery, so it is important to have this radiograph whenever dental surgery is planned. If you would like consult with Atlanta TMJ Dentist, Dr. Padolsky, schedule an appointment at 404-874-7428.